EMC PowerPath VIEWER, One Console to rule them all..
some months ago we released a new version of our PowerPath viewer tool, this release (SP1) add support for ESXi / MS Hyper-V in addition to the Physical Windows / Linux OS’s that it supported before..
as always, this tool can be downloaded (for free) from powerlink. 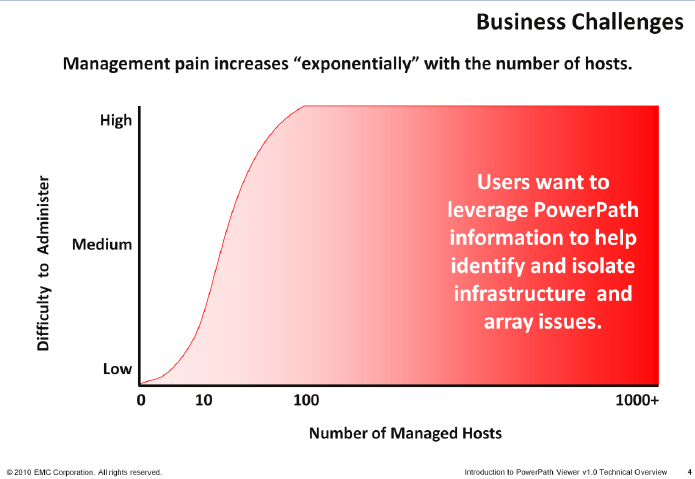 One of the business challenges in many of today’s data centers is to manage a growing number of hosts. Even in data centers where PowerPath is used, monitoring the storage infrastructure gets to be very complex as the number of hosts increases. The PowerPath “powermt display”CLI command provides specific information that helps users trying to identify and isolate infrastructure and array issues. However, it can be tedious to issue this command on each individual host, when there are tens or maybe even hundreds of hosts in the data center. PowerPath Viewer version 1.0 provides a great solution for easily monitoring configurable “alerts” for hundreds of PowerPath Hosts. This utility accepts the type of data normally shown with the powermt display command from each monitored PowerPath host and displays the consolidated information on a centralized management station. Users can see the big picture for their storage infrastructure, or drill down for details. Information is displayed in a user friendly GUI. 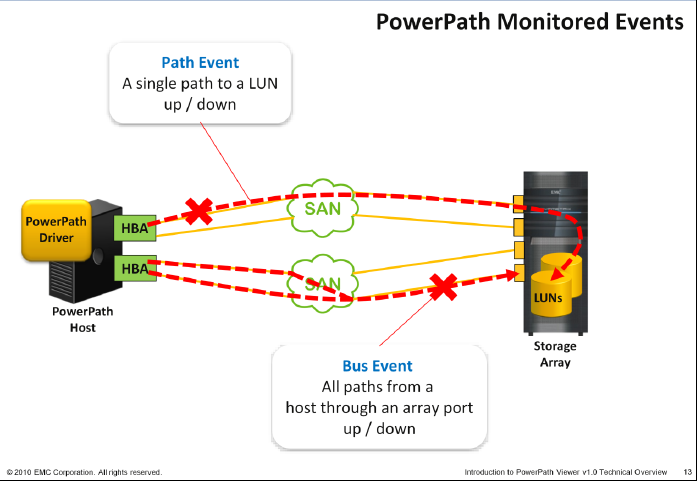 From a single console, users can easily keep track of path, bus and LUN events for each PowerPath host. 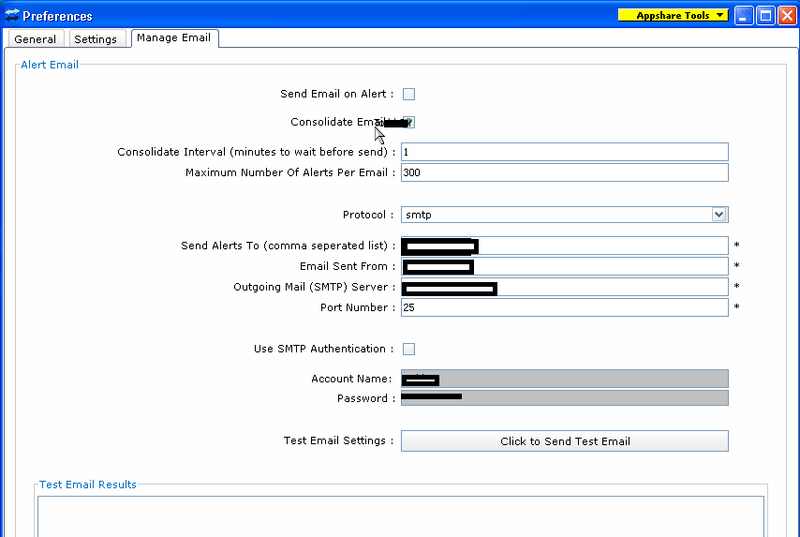 Email alerts can be configured to notify an administrator when certain events occur. This tool provides clear business benefits as less time and fewer resources are required to monitor a complex storage infrastructure. Note: PowerPath Viewer version 1.0 is a controlled release and the first deliverable of a vision to provide centralized GUI-based monitoring and management of a multi-host PowerPath environment. PowerPath Viewer is ECUE-compliant (EMC Common User Experience) meaning it has the same look and feel as other EMC software management tools. 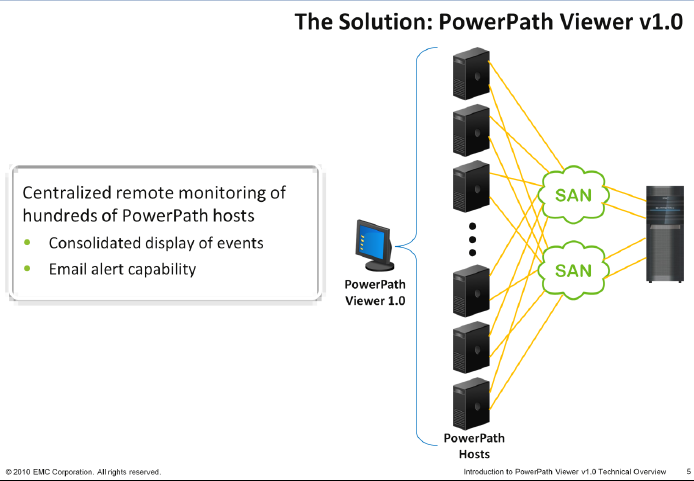 Events reported by the PowerPath Driver are shown in this diagram. The pathrefers to the physical route between a host and a logical device. This includes the host bus adapter (HBA), one or more cables, a switch or SAN, a storage system interface and port, and a LUN. A path event means that there has been a change in path status. This means a path to a LUN was dead and is now alive, or a path to a LUN was alive and is now dead. The busrefers to two end points in the storage configuration: the HBA and the array port. This differs from the path, which refers to the HBA as one end point and the LUN as the other end point. A bus event means that there has been a change in the status of the bus, which includes all paths from a host through an array port. This means the bus had at least one good path and now has none, or a bus had no good paths, and now has at least one. 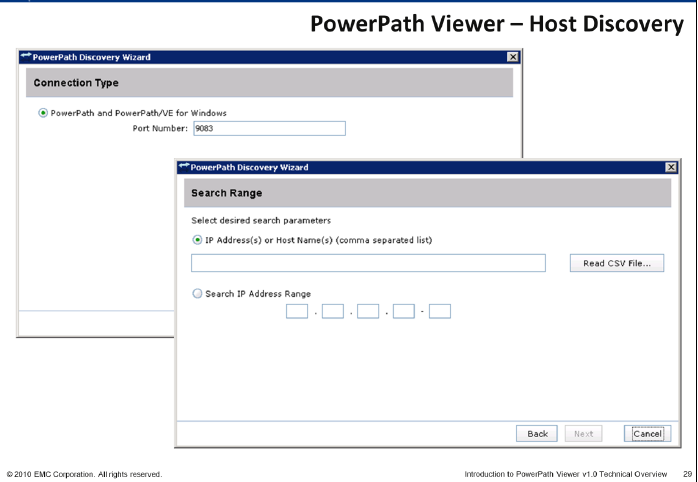 There are two components required for PowerPath Viewer to operate. The first component is the PowerPath Management Component of the PowerPath Service (the management component) that runs on each PowerPath host that you wish to monitor. 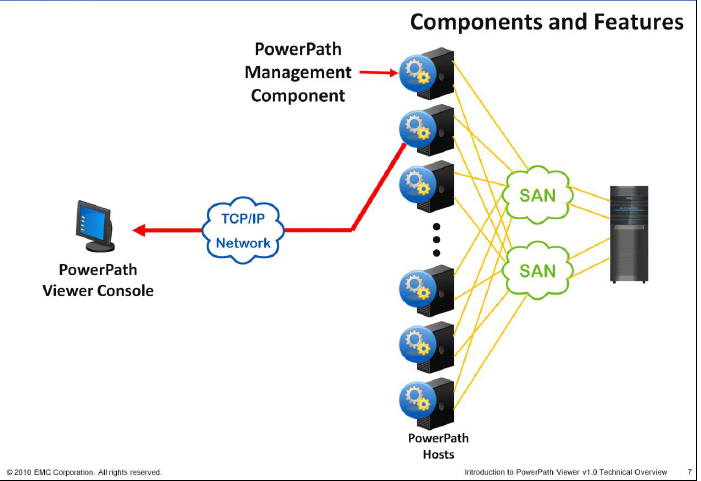 The PowerPath Management Component is supported by the existing PowerPath Windows Service, which also supports SNMP and the local PowerPath for Windows GUI. The second required component is the Java-based PowerPath Viewer Console that consolidates all of the PowerPath hosts information and displays it in a user-friendly GUI. 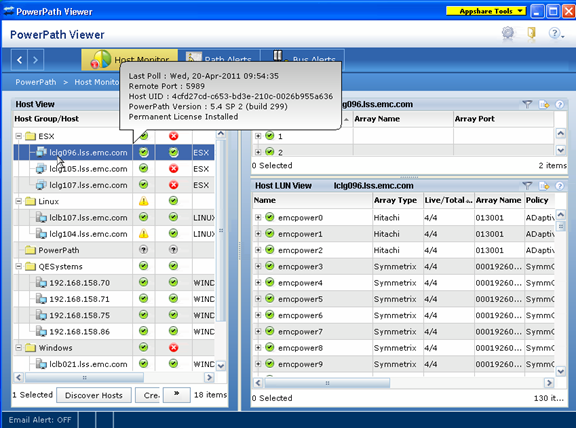 A TCP/IP network provides the link between the PowerPath hosts and the PowerPath Viewer Console. After installing the PowerPath Viewer Console software, you need to discover your PowerPath hosts. Remember that each of the hosts you discover must first have the PowerPath Management Component configured. As shown here, you must specify which TCP port is used to communicate with the PowerPath host. You must also ensure that this port is open on the firewall. Since this port is assigned to PowerPath, no other application should be using it. There should be no reason to change from the default value of 9083. You can enter the IP address of each host you want to discover, or you can specify a range of IP addresses to search. If you are setting up multiple PowerPath Viewer Consoles, you may want to use a CSV (comma separated value) file. The Read CSV File feature reads hostnames from a .txt file that is stored on your PowerPath Viewer host and automatically populates the hostnames contained in the .txt file to the IP Address(s) or Host Names(s)field in the PowerPath discovery wizard. 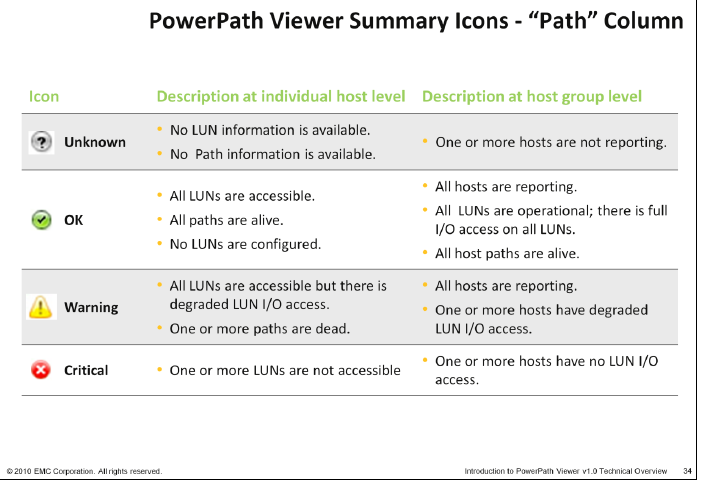 Icons are used in the Path and Setup columns to give a quick summary of the state of each monitored PowerPath host. There are also tabs you may select to get a summary of Path Alerts and Bus Alerts, as shown here. Previous Post Previous post: EMC Virtual Storage Integrator (VSI) 4.1 is Out! Go Grab it..